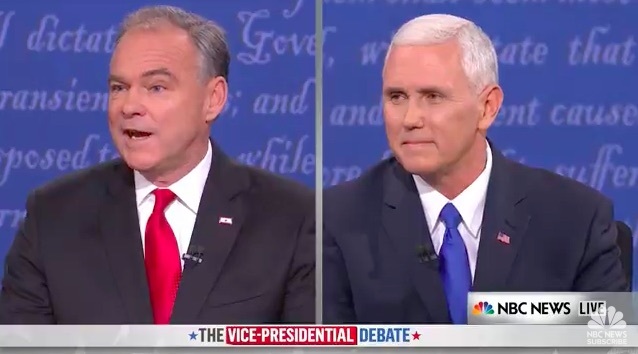 Whether or not you watched last night’s vice presidential debate between Hillary Clinton’s running mate Tim Kaine, and Donald Trump’s right hand man, Mike Pence, you’re probably aware that it was spirited and tense at certain points, and there was a lot of talking over one another. Reactions and social commentary have been pouring in on Twitter from familiar names we know and love, and here are some of the most notable. He has a point; it was intense. Kinda hard to watch. Hate to #fatshame fat men in Trump’s camp who fat-shamed former Miss Universe, but too bad they can’t see their own balls b/c they’re yuge! Pence hates gay people and women, but I'm sure he's a GREAT guy!!! Hmmmm… tell us what you really think! No, in all honesty, it’s great that the presidential election is encouraging such lively discussion, and hopefully it means that more people will get out there and register to vote. Let’s face it, none of us can be unhappy with the result if we don’t participate in the big decision. The second presidential debate is this Sunday, October 9th, and we’re sure that it will spawn similar reactions on social media. We hope that these celebs hop on board again, because their tweets provided a brilliant commentary as the event unfolded. And in the aftermath, since we’re still talking about it.